DuPont Kocide 3000 contains 46.1% copper hydroxide (copper equivalent 30%). This is a finer grit of cupric hydroxide than Kocide 2000. There are many advantages to this newer product. It is used at rates equal to 50-60% of Kocide 2000, meaning less metallic copper is applied to the environment, while achieving even better disease control. 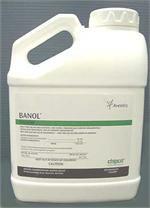 It has better dispersion meaning the DF formulation mixes instantly in water for optimum dispersion. It stays in suspension longer and has low foaming characteristics. Kocide 3000 is even safer and easier to use. One level tablespoon per 1,000 sq. 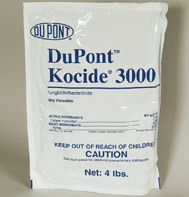 ft. of DuPont Kocide 3000 should be applied, mixed in adequate water for thorough coverage of plant parts. Less metallic copper is applied per acre which improves worker safety. The finer grind allows for better dispersal and lower use rate per acre. Increased bioactivity, excellent dispersion, and long residual all add up to make Kocide 3000 the best copper fungicide your money can buy. Would you like to see the Kocide 3000 Label? How about the Kocide 3000 MSDS sheet?